Figure 1. 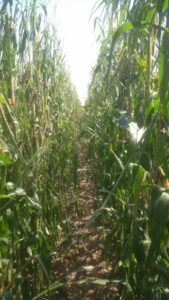 Corn canopy with 50% or more defoliation 10 days after a July 26 hail storm, Denfield, ON, 2018. As occurs most years, summer thunderstorms brought localized hail events through parts of Ontario, particularly during the last week of July (Figure 1). After a hail event, our first question is usually how much leaf tissue is still out there? When evaluating damage, it’s good to wait a week or so before going in. This gives time to let dead or damaged tissue clearly senesce, and gives us a better picture for what amount of green living tissue still remains. 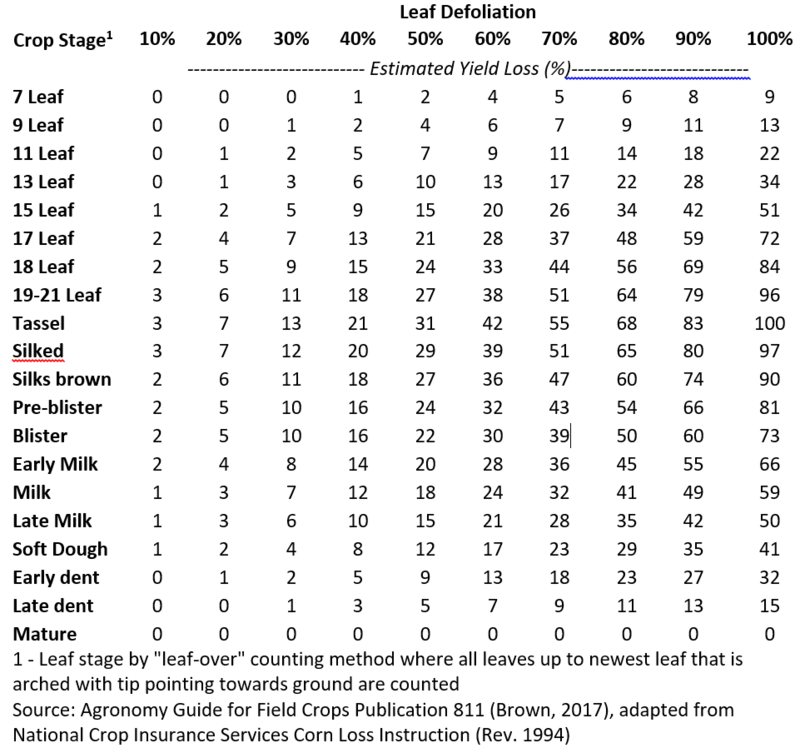 Defoliation tables give estimated yield loss for defoliation at various crop stages, and can be used to estimate yield loss from a hail event (Table 1). Like most stresses, yield loss from defoliation increases through vegetative stages, peaks around tassel or pollination, and declines through grain-fill. For example, estimated yield loss from a hail storm producing 50% defoliation would be 3% at the 8 leaf stage, 30% at tassel, and 15-20% during the milk stage. Depending on crop stage and level of damage, variability in recovery time may also induce plant to plant variability (Figure 2). Figure 2. 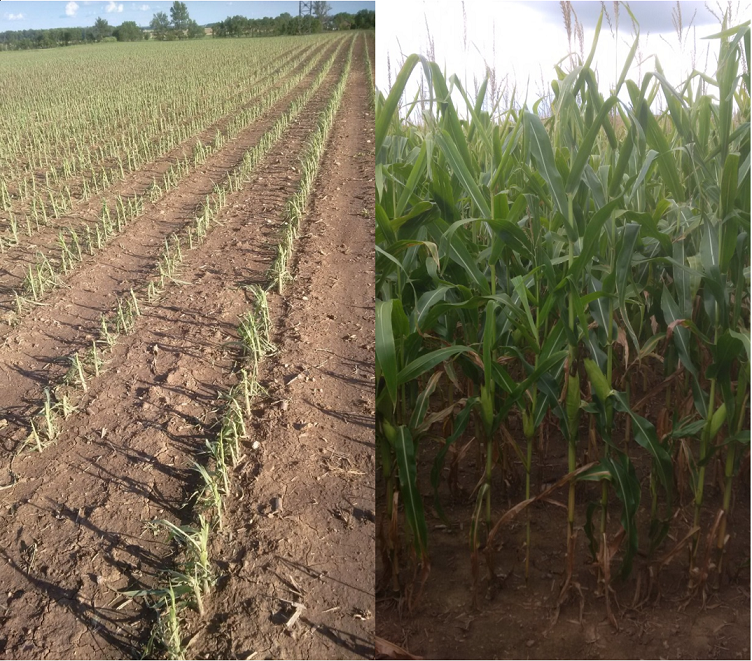 Variability in plant recovery timing from severe defoliating hail event at 8 leaf stage (left) was likely the driver for the plant to plant variability evident in this field by grain fill (right). A common question after hail damage is should I apply a foliar fungicide to protect the damaged plant? Trials have evaluated whether there is an enhanced yield response to foliar fungicides following mechanical damage simulating hail, and have generally shown there is no greater response to fungicides following damage than where there was no damage (Sisson et al, 2016; Bradley and Ames, 2010). This may reflect the fact that foliar fungicides are protecting against fungal diseases (northern corn leaf blight, common rust, grey leaf spot, eyespot) which don’t require wounds to initiate infection. Opportunistic diseases which do take advantage of plant wounds include bacterial wilts, smuts and stalk or ear rots. Most modern grain corn hybrids generally have good resistance against smuts, and to date Goss’s Wilt has not been found in Ontario. Most hybrids have good protection against Stewart’s Wilt, but infection primarily requires flea beetle feeding. Foliar fungicides do not protect against these diseases. Certain fungicides are labelled for suppression of ear and stalk rots, risks of which may increase with hail damage, but research investigating suppression in regards to hail events is limited. Last, what other considerations should we have for fields that have been damaged by hail? In corn receiving significant defoliation from late vegetative to early reproductive stages, reduced photosynthetic capacity may make ear filling a priority over stalk deposition, or make plants more reliant on remobilization from stalks to help meet grain fill needs. This may weaken stalks and predispose fields to lodging or stalk rots. This may also drive earlier maturity but lengthen kernel dry down, and may lower test weight (Lauer, 2006). 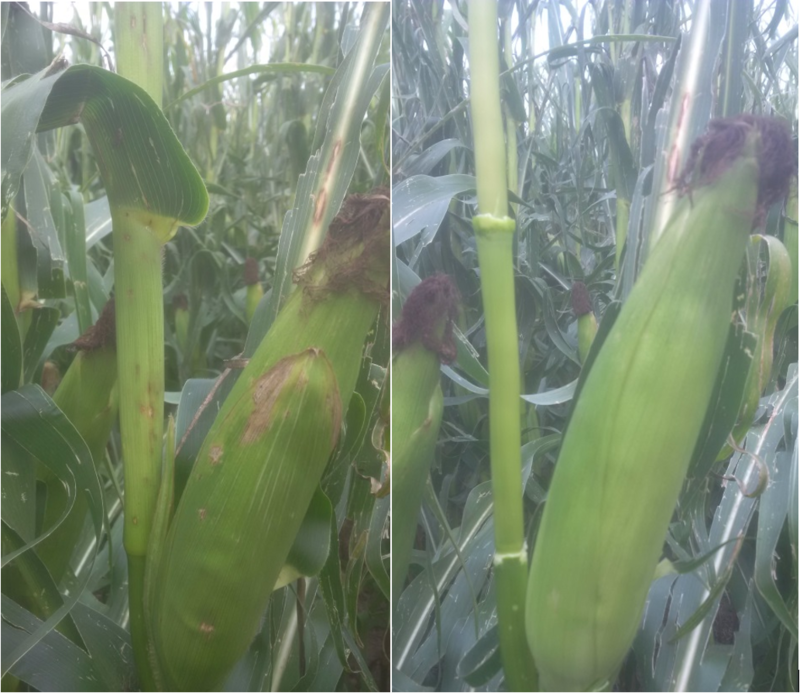 Hail wounds or bruising on stems or ears may also provide entry points for stalk rots or ear moulds, and can increase risks if environmental conditions are favourable for rot or mould development. Inspect damage to see if bruise marks are superficial on husks or leaf sheaths, or have penetrated through to damage stems or ears (Figure 3). Hail damaged fields should be monitored more closely at harvest due to these elevated harvestability and grain handling risks. Figure 3. Hail marks on leaf sheaths and outer husks generally did not transfer to stem or inner husks on this plant. Bradley, C.A. and K. A. Ames. 2010. Effect of Foliar Fungicides on Corn with Simulated Hail Damage. Plant Dis. 94:83-86. Brown, C., editor. 2017. Agronomy Guide for Field Crops Publication 811. Ontario Ministry of Agriculture, Food and Rural Affairs. Lauer, J. 2006. Hail Damage on Corn. University of Wisconsin. http://corn.agronomy.wisc.edu/Management/L039.aspx (accessed 20 Aug. 2018). Sisson, A.J., Y.R. Kandel, A. E. Robertson, C. E. Hart, A. Asmus, S.N. Wiggs and D. S. Mueller. 2016. 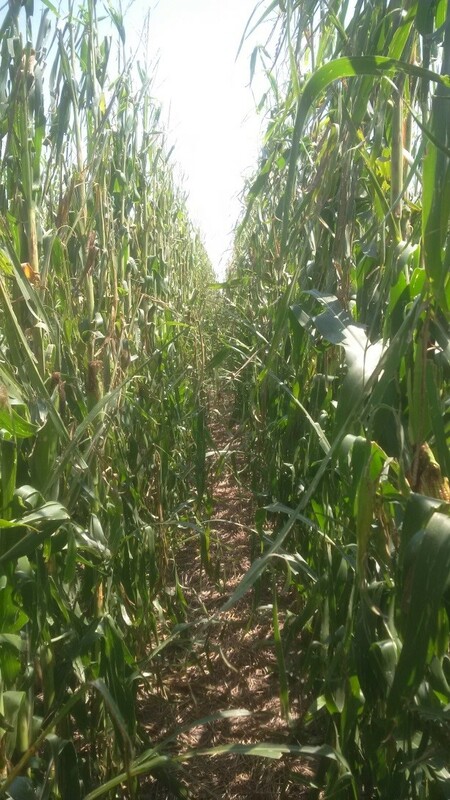 Effect of foliar fungicides on hail-damaged corn. Plant Health Prog. 17:6-12.